The Spanish Civil War was a major conflict in Spain that started after an attempted coup d'Ã©tat by a group of Spanish Army generals, supported by the conservative Confederación Española de Derechas Autónomas (C.E.D.A), Carlist groups and the fascistic Falange Española de las J.O.N.S., against the government of the Second Spanish Republic, then under the leadership of president Manuel Azaña. 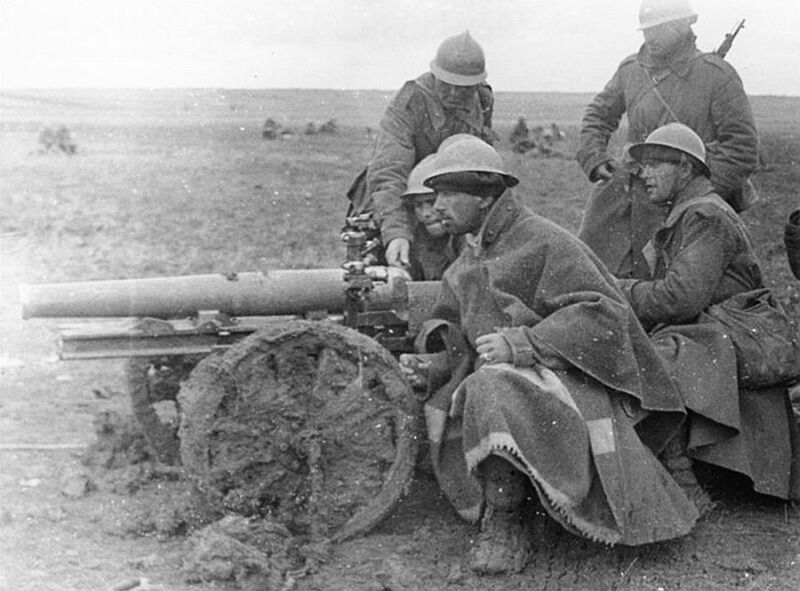 The Civil War devastated Spain from 17 July 1936 to 1 April 1939, ending with the victory of the rebel forces, the overthrow of the Republican government, and the founding of a dictatorship led by General Francisco Franco. In the aftermath of the civil war, all right-wing parties were fused into the state party of the Franco regime. Republicans (republicanos) gained the support of the Soviet Union and Mexico, while the followers of the rebellion, nationalists (nacionales), received the support of Italy and Germany, as well as neighbouring Portugal. The war increased tensions in the lead-up to World War II and was largely seen as a possible war by proxy between the Communist Soviet Union and the Fascist Axis of Fascist Italy and Nazi Germany. In particular, tanks and bombing of cities from the air were features of the later war in Europe. The advent of the mass media allowed an unprecedented level of attention (Ernest Hemingway, Martha Gellhorn, George Orwell and Robert Capa all covered it) and so the war became notable for the passion and political division it inspired, and for atrocities committed on both sides of the conflict. 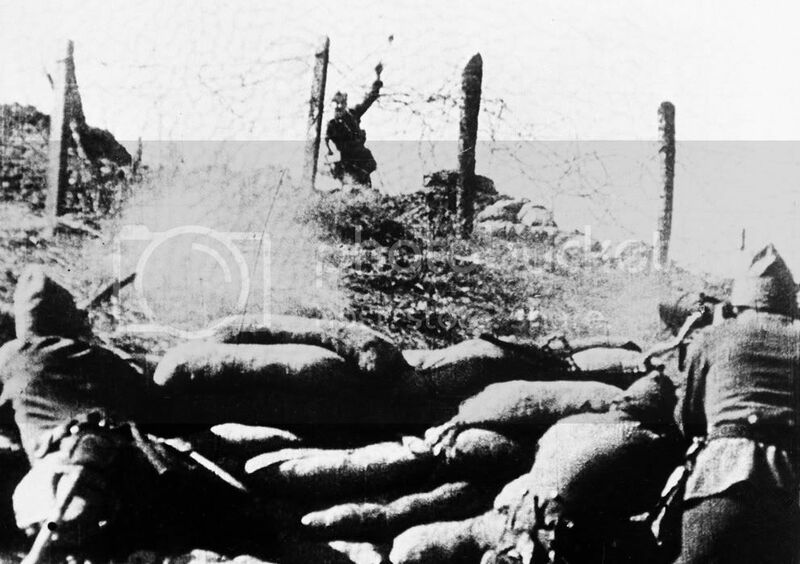 Like other civil wars, the Spanish Civil War often pitted family members and trusted neighbours and friends against each other. Apart from the combatants, many civilians were killed for their political or religious views by both sides, and after the war ended in 1939, Republicans were at times persecuted by the victorious Nationalists. The Cerro de los Ãngeles (Hill of the Angels) is a famous hill located in Getafe, Spain, about 10 km (6 miles) south of Madrid. The site is famous for being considered the geographic centre of the Iberian Peninsula. 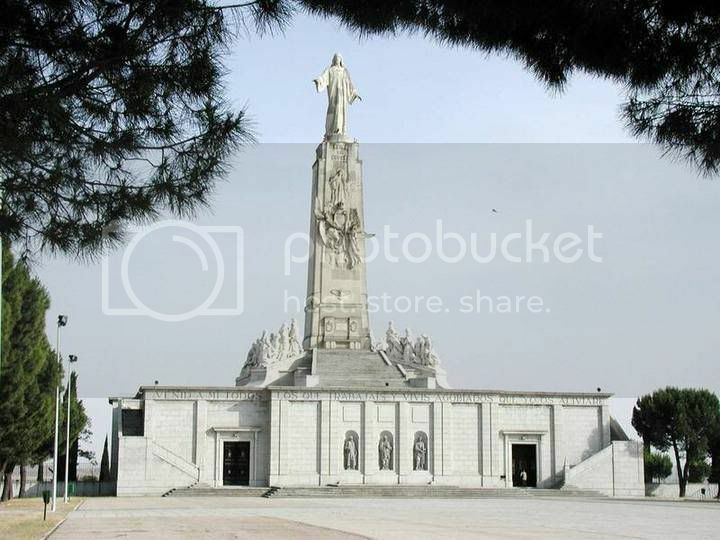 On top of the hill there is a 14th century monastery named Our Lady of the Angels (Nuestra SeÃ±ora de los Ãngeles), as well as the Monument to the Sacred Heart [of Jesus] (Monumento al Sagrado CorazÃ³n), built in 1919 to dedicate the country and inaugurated by king Alfonso XIII. 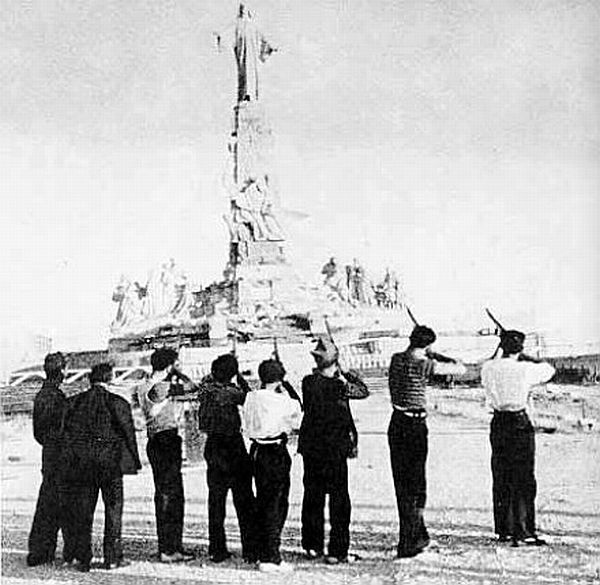 Several Spanish Civil War battles occurred on the hill, resulting in the destruction of the original monument. Bullet marks dating from the war can be seen on the Sagrado CorazÃ³n monument as well as the walls of the monastery. After the war, the victorious government moved the remains of the monument across the esplanade and rebuilt a bigger version with an underground church. 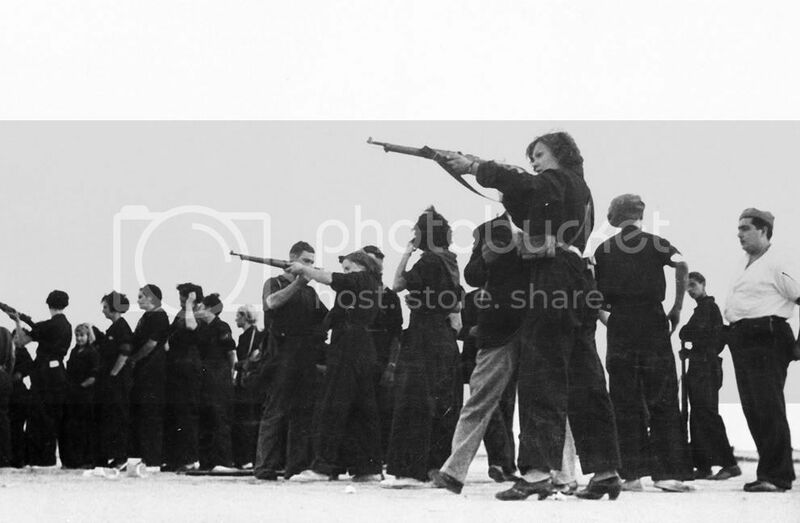 Caption- "Spanish Leftists shoot statue of Christ"
Loyalist soldiers teach women how to fire rifles as they prepare to defend Barcelona. 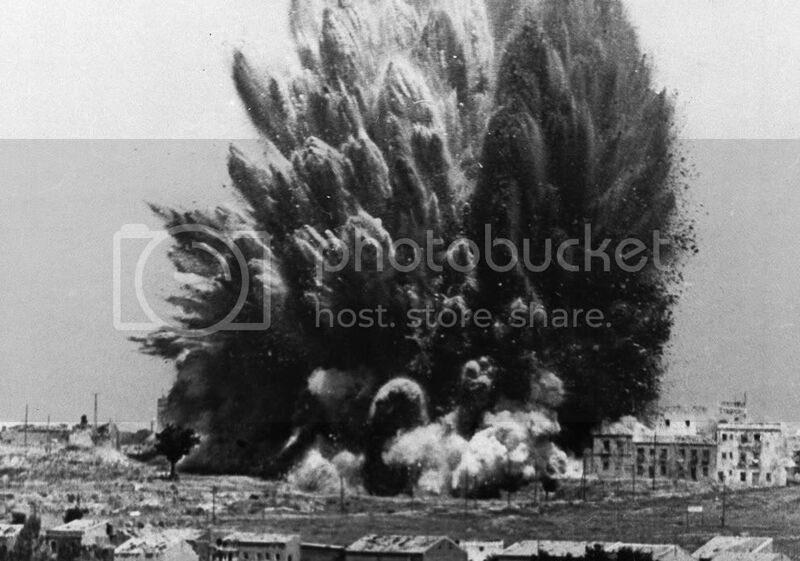 "Three hundred fascist insurgents were killed in this explosion in Madrid, Spain, under the five-story Casa Blanca building, on March 19, 1938. Government loyalists tunneled 600 yards over a six-month period to lay the land mine that caused the explosion." 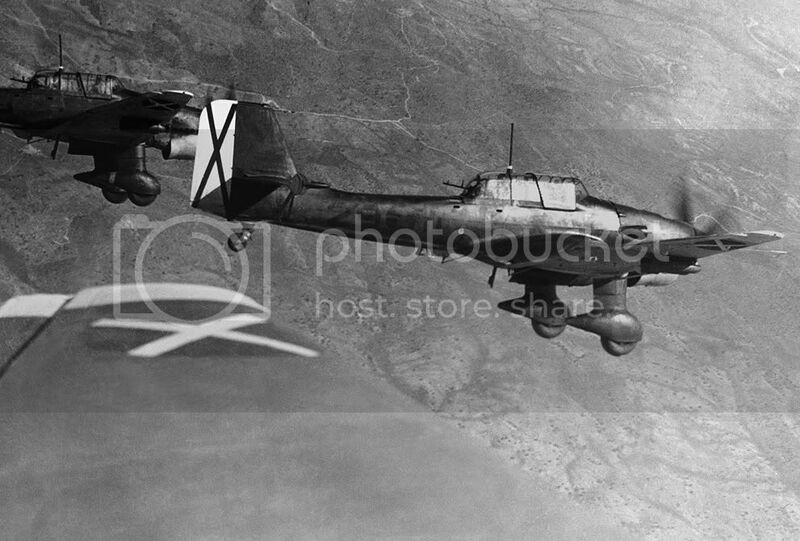 German-made Stuka dive bombers, part of the Condor Legion, in flight above Spain on May 30, 1939, during the Spanish Civil War. The black-and-white "X" on the tail and wings is Saint Andrew's Cross, the insignia of Franco's Nationalist Air Force. The Condor Legion was composed of volunteers from the German Army and Air Force. 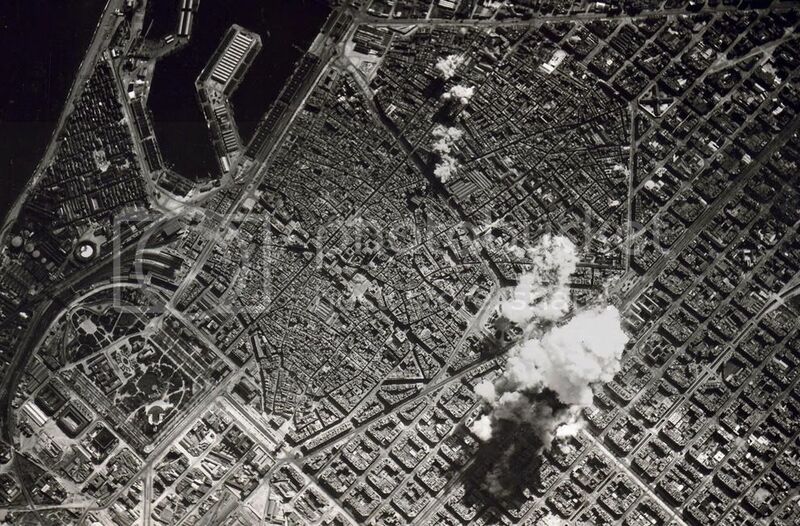 Aerial bombing of Barcelona in 1938 by Franco's Nationalist Air Force. The Spanish Civil War saw some of the earliest extensive use of aerial bombardment of civilian targets, and the development of new terror bombing techniques. 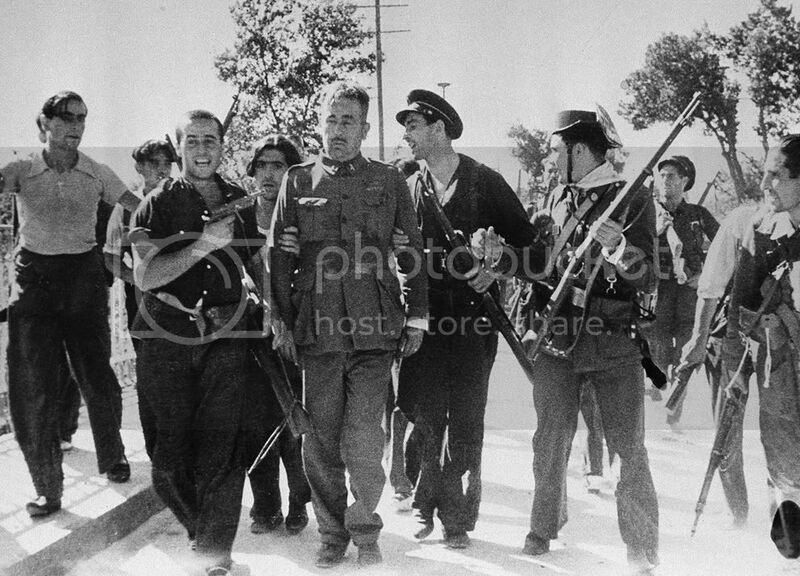 A Spanish rebel who surrendered is led to a summary court martial, as popular front volunteers and civil guards jeer, July 27, 1936, in Madrid, Spain. 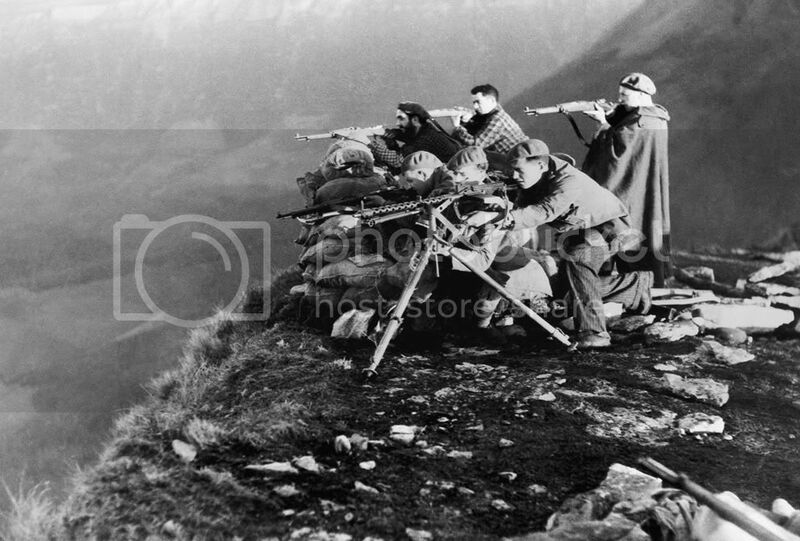 A fascist machine gun squad, backed up by expert riflemen, hold a position along the rugged Huesca front in northern Spain, Dec. 30, 1936. 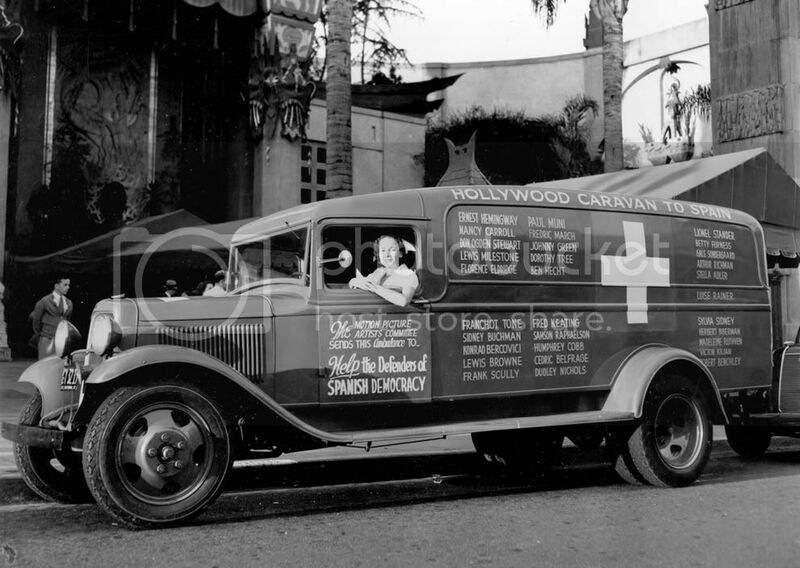 Riette Kahn is shown at the wheel of an ambulance donated by the American movie industry to the Spanish government in Los Angeles, California, on Sept. 18, 1937. The Hollywood Caravan to Spain will first tour the U.S. to raise funds to "help the defenders of Spanish democracy" in the Spanish Civil War. 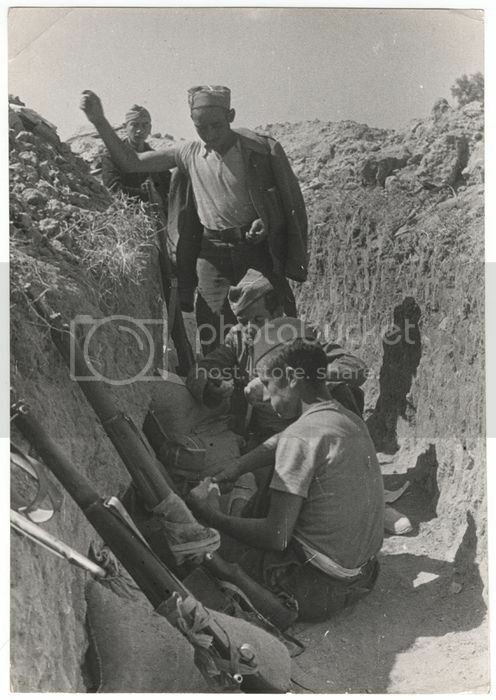 Republican soldiers in a trench, Battle of Brunete, June 1937. 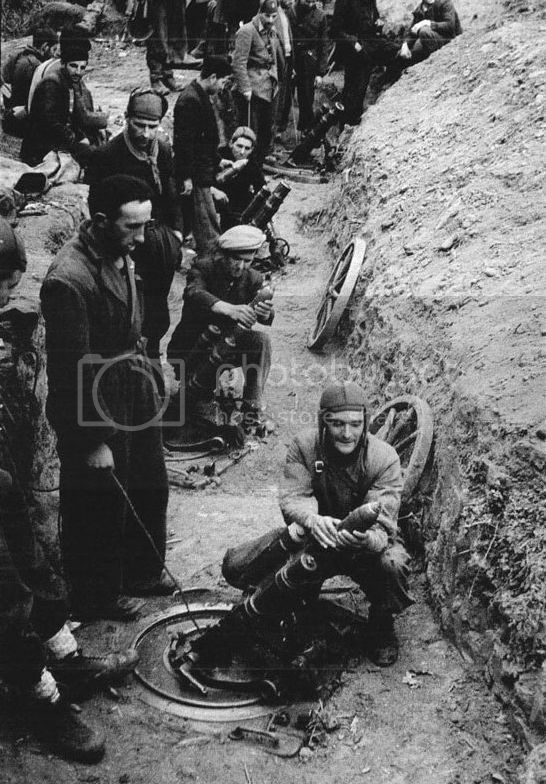 Trench mortar battery, Erhardt type of 76 mm., located in the republican positions encircling in Oviedo. Civilians of Gibraltar and spanish refugees watch the bombardment of Algeciras city. Aug 1936.